This beautiful detached property has been built in recent years and boasts a wealth of period features and exposed timbers, dating back to circa 1690, adding a fascinating historic dimension. The property, arranged over four floors, offers a home of great style with modern, yet traditional conveniences and within a short distance of Chalfont St Giles village centre. As you enter the property, you are immediately struck by the elegance and character of the home, with its good sized reception hall with views out to the walled patio, accessed via bi-folding doors from the open plan sitting room. Solid oak flooring flows throughout this level, interconnecting each generous living space. The bespoke solid birch kitchen is an outstanding feature of the accommodation and boasts a range of cabinets with granite work surfaces and a Range cooker. The kitchen also features a wood burning stove, and has double doors leading out on to a veranda. The light and airy triple aspect family room which is situated at the opposite end of the house also features a wood burning stove. The study enjoys views over the walled patio. The first floor offers a galleried landing area with a low level window. The master bedroom is a stunning vaulted room with an en-suite and spiral stair case leading up to the balconied dressing room on the second floor. Bedrooms 2 and 3 also benefit from en-suite bathrooms. Bedroom 5 is accessed via its own staircase and is situated on the second floor, with a window overlooking the galleried landing. The lower ground floor boasts a good sized games room with an array of storage cupboards. The utility room also leads out to the double garage and car port. 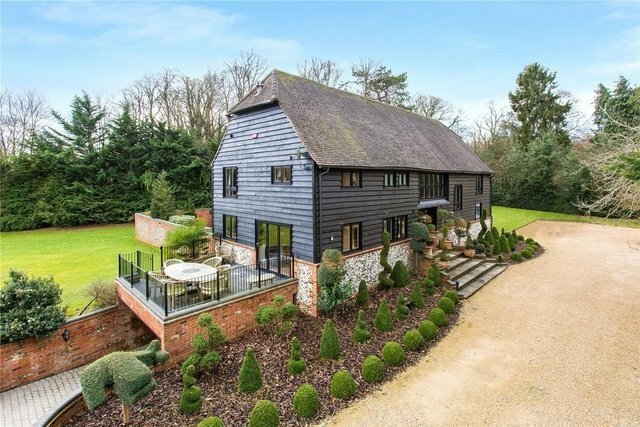 Approached through wooden electric gates, and along a sweeping gravel driveway, this home is surrounded by its landscaped gardens and is well-screened by mature trees and hedging. Accessed directly from the sitting area, is a large walled patio area, currently with a hot tub, and is ideal for entertaining. Leading directly from the kitchen breakfast room is a good sized veranda.